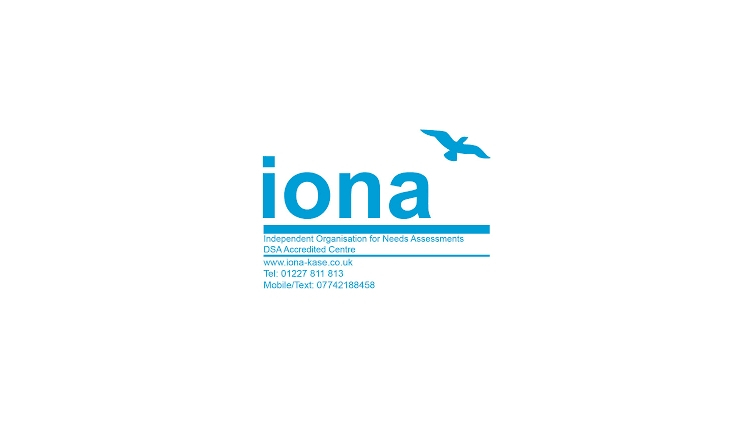 Iona Kent and South East is a DSA-QAG Accredited Centre and carries out needs assessments for all disabilities for funding bodies through the UK. Since 2004, The Iona Assessment Centre has, in the students’ interest, worked closely with and established, collaborative links with many public-sector specialists, FE and HE Institutions, which include The Open University; University of Kent at Canterbury and Medway; Canterbury Christ Church University; University for the Creative Arts in Canterbury and Rochester; Canterbury College; The National Autistic Society (NAS); Working with Dyslexia; Dyslexia East Kent Support Group (DEKS), Trinity Laban Conservatoire of Music and Dance in Greenwich; Goldsmiths, University of London, The Oxford Access Centre and the RNIB/Action Group in Judd Street, London. The Iona Centre selects and trains all their Assessors who are drawn from a broad range of pertinent disciplines. The principal assessment team brings together a collective experience across the full spectrum of UK educational provision and regulation for all disabilities. Members of the Iona team currently support institutions such as the RNIB/Action Group, Trinity Laban Conservatoire of Music and Dance, University of Kent and Birbeck College in London. other conditions e.g. diabetes, chronic fatigue syndrome, irritable bowel syndrome, musculoskeletal disorders, pain disorders etc. The Iona Centre has continued to be proactive in convening and running numerous DSA events to promote awareness and interaction between students and all stakeholders in the SE Region. Events have included presentations and training for Chartered Educational Psychologists; Student Award Officers at The Open University; Disability Advisors, Specialist Tutors, Mentors and other HEI disability staff; Diagnostic Assessors (PATOSS) and a DSA Symposium on Quality Assurance (QA) for Student Finance England (SFE) Management and Assessment Centre Managers. Open Days, supported by DSA Suppliers of specialist equipment and assistive software, and regular Continuous Professional Development (CPD) events, to update disability awareness, specialist product knowledge and DSA changes, are also run for Needs Assessors and local HEI disability teams. Students, parents, teachers and charitable organisations, such as NAS, DEKS, MIND, Demelza House, are welcomed at these events, for which there is no delegate fee. IONA are providing two work experience placements, where the student will undertake research projects focusing on all forms of disability.